Have you read the Literature Review? If so, we’d love to hear your thoughts! In the video below, Dr. Andrea Creech, lead author of the 2013 Sistema Global Literature Review, shares her experience working on the project and her thoughts on El Sistema-related research. 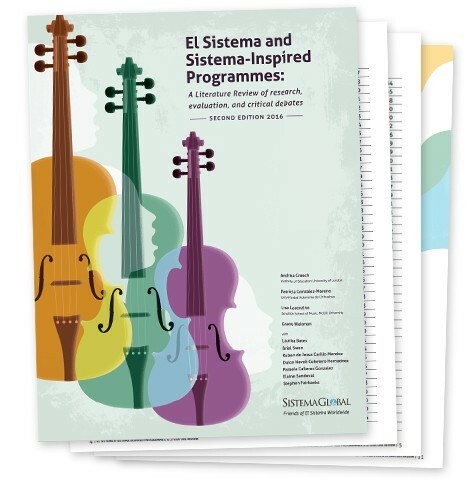 I am very pleased to announce the publication of an update to the Literature Review of El Sistema and Sistema-inspired Programs. This first and only foundation survey of the worldwide Sistema field has been revised with new findings. This winter 2016 version includes new scholarly publications on El Sistema. Our team hopes the new data will inform and support the work of hundreds of local programs worldwide. - What makes ‘Sistema’ distinctive? - How does it relate to the wider music education landscape? - How can the pedagogical practices developed in Sistema-inspired contexts be delivered to benefit all? Please download your copy of the literature review update at www.sistemaglobal.org/litreview. As usual, we welcome any feedback and comments on the download page, or through the Sistema Global LinkedIn Group: www.sistemaglobal.org/linkedin. In particular, please send any suggestions on how we can continue to make El Sistema related research more accessible, through the literature review or other means. I acknowledge and deeply appreciate the continued leadership of Dr. Andrea Creech of The Institute of Education, University College London, and her distinguished team in writing and revising this literature review. Watch an interview with Andrea discussing the literature review here! https://youtu.be/PC8c5A-Sa6A.